DeepSee dashboard technology enables you to create web-based dashboards for your end users. Despite the specific name, these dashboards are not reserved solely for DeepSee users and can display data other than DeepSee data items. Among other items, dashboards can display iKnow KPIs (key performance indicators). In general, a KPI is a query that can be executed and displayed on dashboards; when the dashboard is displayed, the query is executed. An iKnow KPI uses an iKnow ObjectScript query. In a KPI, each row returned by the query is a separate series of the KPI. The following shows some of the series of a KPI (as seen on the KPI test page, discussed later in this chapter). The series names are shown in the first column of the KPI Values table. 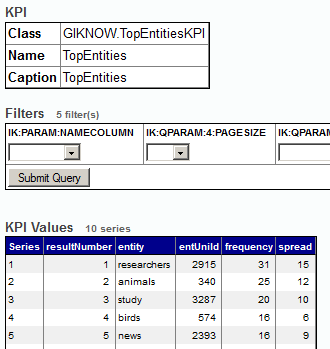 For iKnow KPIs, the name of a series (by default), is the value in the first column returned by the query. A KPI also contains properties, each of which corresponds to a column in the returned data. In the previous example, the KPI has five properties. When you define an iKnow KPI, you can override these property names and their order. The KPI query can include parameters. These are called KPI filters, because they usually (but not always) filter the values returned by the KPI. The KPI test page shows all the available KPI filters. The iKnow KPI mechanism automatically provides a set of KPI filters for any iKnow KPI. A KPI can also define actions, which execute custom code. When you add a KPI to a dashboard, you can add controls to the dashboard to execute these actions. 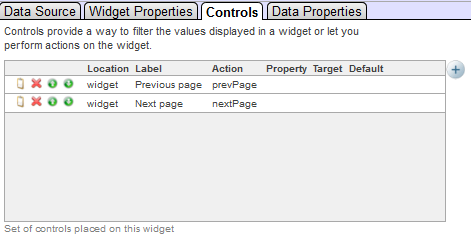 For any iKnow KPI based on a query that uses paging, that KPI defines the Previous page and Next page actions. Specify the integer ID of the domain. To do so, override the IKDOMAINID class parameter and set it equal to the integer ID of the iKnow domain. IKCUBENAME  Should equal the logical name of a DeepSee cube. IKMEASURENAME  Should equal the local name of an iKnow measure in the given cube. This technique is possible only if you are using the DeepSee cube integration; see the Advanced DeepSee Modeling Guide. Within DeepSee dashboards, this affects the number of rows shown per page in a dashboard widget. Optionally use the KPI test page. If you are currently viewing the class in Studio, click View > Web Page. Many of the iKnow queries include a filtermode argument that you use to specify the statistical reprocessing to perform after applying a filter; see Filter Modes, earlier in this book. When you use such queries directly, the default filtermode is $$$FILTERONLY, which performs no reprocessing. When you expose such queries as an iKnow KPI, the filtermode argument is always specified as $$$FILTERALLANDSORT, so that the frequency and spread statistics are recomputed and the results are re-sorted. Therefore you might see different results when using these queries as iKnow KPIs than when using them directly, depending on how you specify filtermode. 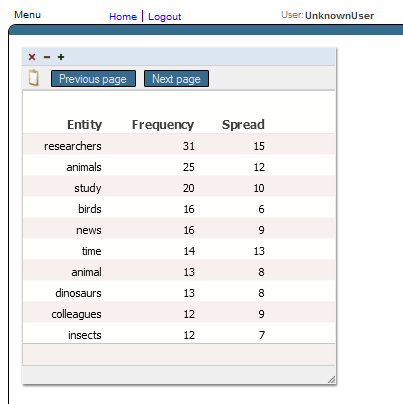 For another example, see Example Dashboard with iKnow KPI, in the next section. To make a KPI available to users, you add it to a dashboard. 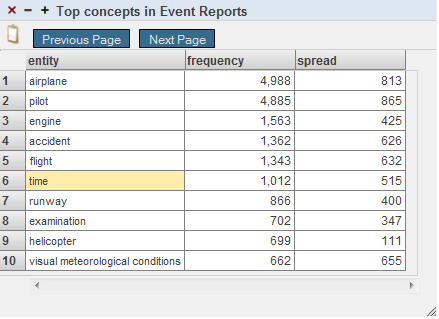 Users can then access the dashboard in various ways; see Providing Access to Dashboards, later in this chapter. Click Home,DeepSee,User Portal and then click View. If you chose a scorecard, see Configuring the Properties, later in this section. In this example, Tutorial is the name of the folder that contains the dashboard, and My First Dashboard is the name of the dashboard. You can provide a user portal that has the ability to display dashboards. You can use the DeepSee User Portal or create your own. For information on Zen pages, see Using Zen. For information on creating DeepSee dashboards, see Creating DeepSee Dashboards. For information on accessing dashboards from your application, see Accessing Dashboards from Your Application in the DeepSee Implementation Guide. For information on packaging dashboard definitions into classes, see Packaging DeepSee Elements into Classes in the DeepSee Implementation Guide. For information on the DeepSee User Portal and dashboards, see the DeepSee End User Guide.